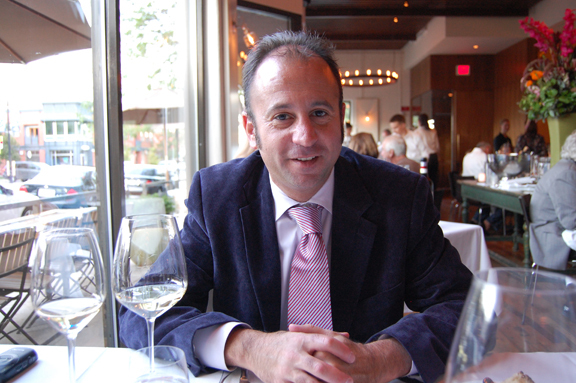 In 2007, food and wine historian, Italian translator, and rock musician Jeremy Parzen Ph.D. created his blog “Do Bianchi” to offer readers a humanist perspective into the world of Italian wine and food. Although much has been written about Italian gastronomy in this country over the last two decades, the great misunderstanding known as the Atlantic Ocean continues to dilute much of the information that makes the crossing. Do Bianchi’s mission is to offer non-Italian speakers otherwise inaccessible insights into Italian gastronomic culture. For Italophiles and Italians, Do Bianchi provides cogent historical perspective into wines and foods whose cultural value is often taken for granted. Named after a common Venetian expression (often overheard by the blog’s creator in the taverns of Venice, “Two White Wines”), Do Bianchi is considered a leading resource for information on Italian food and wine in this country. ABOUT needs a photo of Signore Parzen. I´m a German journalist, staff writer for “Die Zeit”, currently doing research on the Medicis´influence on German cuisine. The couple took residence in Duesseldorf , a town with 8000 inhabitants by that time, (pavement and street lights newly introduced to impress the young bride). Art historians say Anna Maria Luisa did a lot to make Duesseldorf a place of the arts. There must have been some influence on kitchen culture too. From old bills we can see, that she had Parmesan cheese shipped over the Alps on a regular basis , I also know, she brought cooks from Florence to the Lower Rhine Area, but that´s about it. Since all Germans are fond of Italien cuisine it would be tremendously interesting for our readers to find out what we are owing Anna Maria Louisa recipewise. I know you have done research in the field of food history,.Can you help me out on this special point or -if not -can you recommend a colleague? I found your website accidently while researching here in France! My son’s name is Jeremy as well and I too am from Chicago. I live in Paris France and would like to collaborate with you being I write and sing my own songs. I am looking to collaborate with other venues. Please email me after viewing my website and let me know what you think. Keep up the great work, you seem quite interesting. Wow I have never seen this part before. Brigitte is a good friend of mine from Paris .. and amazing singer :-) and you are from the same part of the world ..Brilliant!! I am originally from Chicago and have for years now lived in Austin.. I have been reading My Life Italian and now your blog.. My dream is to live part of the year in Italy. Maybe our paths will cross one day. Where can we send you samples to of a new wine to review? Howdy, Jeremy — am enjoying your blog a lot and just wanted to introduce myself: I’m a friend of Sarah Brysk Cohen’s and she told me about your work. Just launched a wine blog myself (www.spinthebottleny.com). Am particularly loving your blog as I’ve been feeling a bit too Francophilic lately and need to re-up my commitment to Italian wines. Would be great to meet up when you’re next in NYC. Jeremy, I’m so glad that you stumbled upon my blog and commented because now I have discovered your amazing blog. I plan to visit often and learn as much as I can from you! Wow, you seem to lead a fabulous life! Please have a look at the wine label collages of Valentino Monticello at http://www.valentinomonticello.com they bring a different persepective to the world of wine and opera. Pingback: What’s For Sipper, Do Bianchi? always recommend your wine blog! Just found your site linked from About Italian Food.com. Happy to be on board. I’m an americana from Philadelphia living in Eastern Tuscany fro the last 6 years. Will be tuning into your site. Food, art, music, literature are my favorite subjects. Love studying regional cuisines of Italy. Will be tuning in frequently. @Renaccio thanks for the kind words and thanks for taking time to check out Do Bianchi! :-) Looking forward to seeing you here. I was finishing the UCLA Italian program when you arrived. We met back then, made jokes about Rob Lowe. Congrats on the Brunetta translation and the funny French band names. Question: Why can’t I find dry Lambrusco (cheap) stateside? Pingback: Aglianico, Catarratto, Conegliano – Oh My! I happily landed on your blog while doing a web search for the origins of pasta puttanesca. I enjoy the sprinkle of all other things Italian as I am studying the language. Hey Jeremy saw your comment on the noblewines blog. Yeah I’m new to this blogging & micro blogging stuff, so I finally figured out how to allow comments on that post. Let me know when & if you get to NY, cause I don’t see myself in Austin very soon. Hello, I am trying to visit Montaperti for the cultural signifigance to Dante’s work…What is the address?